Transfer data between your MacBook and other devices. Connect video output such as HDMI, VGA, and DisplayPort. Connect to other technologies, such as Ethernet. The USB-C port on your MacBook supports data-transfer speeds at up to 5 Gbps (USB 3.1 Gen 1). The Apple 29W USB-C Power Adapter and USB-C Charge Cable are included in the box with your MacBook. Connect the adapter to the charge cable to charge your MacBook. You can also use the USB-C Charge Cable to transfer data at USB 2.0 speeds between your MacBook and another USB-C device. Additional USB-C adapters (sold separately) allow you to use the USB-C port to connect displays and other devices to your MacBook. See the sections below for more information. The USB-C to USB Adapter supports data transfer at up to 5 Gbps (USB 3.1 Gen 1). This adapter requires no power to operate. However, devices that you plug into it might draw power from your MacBook, so you should disconnect it when you're not using it. Connect to other standard USB (USB-A) devices or hubs. Connect your MacBook to external HDMI video devices such as a TV, projector, or display. The USB-A port on this adapter supports data transfer at up to 5 Gbps (USB 3.1 Gen 1). Connect standard USB devices or hubs. The USB-C port on this adapter charges your computer, but it doesn't transfer data. Use the supplied to charge your MacBook. Connect your MacBook to external VGA video devices such as a TV, projector, or display. The VGA port on this adapter supports TVs, displays, and projectors that you connect via VGA. It supports these at resolutions up to 1920 x 1200. You can connect USB hubs and devices to the USB-C adapters as described above. USB hubs and other USB devices that supply power won't charge your MacBook. Use the supplied to charge your MacBook. Some USB drives might not appear in the Finder when you plug them in. Try plugging the drive into the adapter before plugging the adapter into your MacBook. Or try connecting the drive through a powered USB A hub. 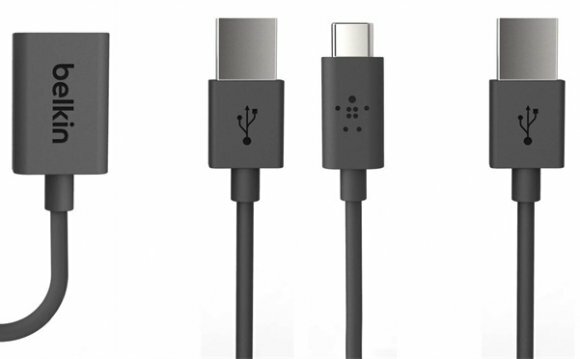 USB 3.0 or USB 3.1 USB-A to USB-C Cable: Use this cable to manually transfer data from any Mac notebook with USB-A port(s) to your MacBook with USB-C port. This cable cannot be used to migrate data using the Setup Assistant or Migration Assistant application. USB 3.0 or USB 3.1 USB-C Cable (USB-C to USB-C): Use this cable to migrate data from any MacBook with a USB-C port to another MacBook with USB-C port using the Setup Assistant or Migration Assistant application. To enable target disk mode, hold down the T button on your keyboard while starting your MacBook. Then connect either of the USB-C cables described above. The (2m) supplied with your MacBook doesn't support target disk mode.